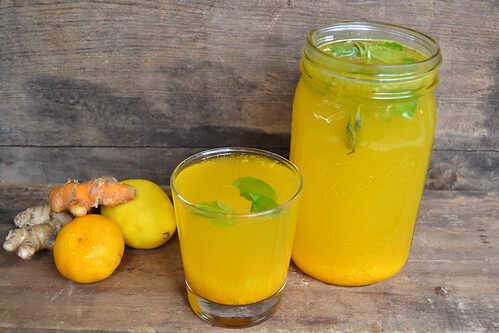 We love drinking this turmeric tonic from Bon Appetit to prevent colds during the winter season when everyone is sick and in close quarters. The turmeric and ginger give this tonic a slight kick that we love. Grate the ginger and turmeric and add to a large glass jar (we used a quart-sized jar). Crush the mint and tarragon leaves and add them to the jar. Squeeze in the lemon juice and Satsuma mandarin juice and add 3 cups water or more, to taste. Drink immediately or refrigerate to deepen the flavors. Strawberry Kiss Cocktail — That's My Jam! 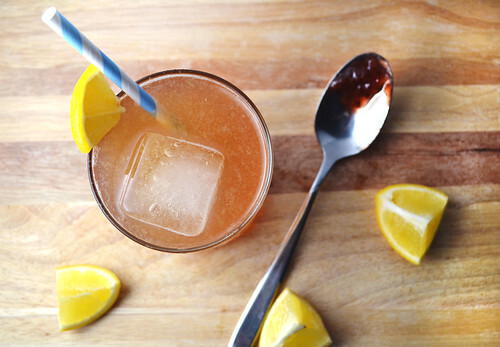 Have you ever had a jam cocktail? We love mixing cocktails with some jam shaken in. They add some sweetness, a little depth and there's something fun about using a typical breakfast condiment in our cocktails. With Valentine's Day coming up, we thought we'd mix up something a little sweet and strong, perfect for saying cheers to your friends, a significant other, or that handsome stranger across the room (it is Valentine's Day after all). * Feel free to add more or less jam depending on how sweet of a Cocktail you prefer. You can also play around with the amount of simple syrup if desired. Remember 1 ounce is equal to 1 typical shot glass. In a cocktail shaker or mason jar fitted with a lid, shake the jam and whiskey until the jam is incorporated. Pour in the lemon juice and simple syrup and shake to combine. Pour into an ice-filled glass and top with club soda or sparkling water. Garnish with a lemon wedge if desired. Enjoy! How To Add Laura Ann's Jams To Your Delivery: CSA members - head on over to our online Farm Stand Market to customize your upcoming delivery. On the second page of customizations, you’ll find the jam selections. The Market is open from noon on Thursday until 10 am, 2 days before your scheduled delivery day. After you confirm your produce items, click the orange button "Confirm and Continue To Other Farm Products" to add the products to your delivery. but planting summer seeds would not work right now. 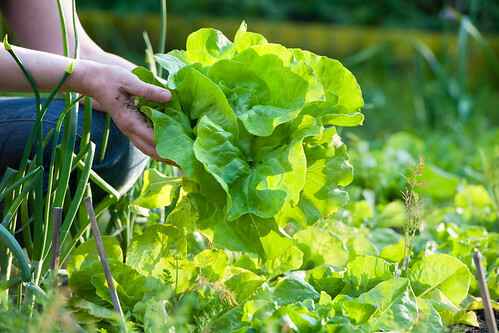 The magic number for summer crops is 50 degrees F. When the soil temperature creeps into the 50’s – and we are safe from freezes – that is spring. 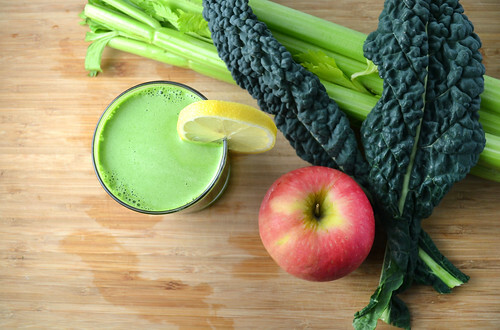 Though there are a lot of green ingredients in this juice, the apple and parsley tame the flavor. We love the dandelion greens for a little kick. Blender/Food Processor Directions: Remove the parsley leaves from the stems. Chop the leaves, celery and kale. Peel, core and chop the apple. Put the parsley, celery, kale, dandelion greens and apple in the food processor or blender with a little bit of water and process until smooth. Squeeze in some lemon juice and pulse to combine. Strain if desired, pour into a glass and enjoy. 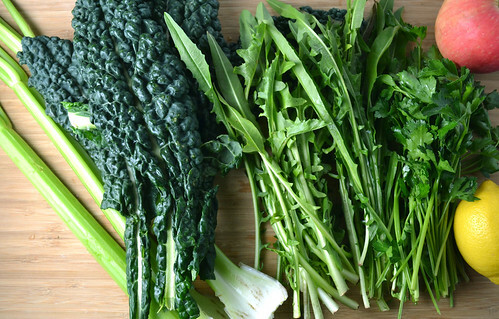 Juicer Directions: Feed the parsley, celery, kale and dandelion greens down the chute one at a time until processed. Cut the apple in halves or segments and put them down the chute. Peel the lemon and feed that down. Pour into a glass and enjoy. Winter time means citrus time and we couldn't be happier. Staying healthy during winter can seem nearly impossible and sometimes we just want some fresh fruit! Packed with vitamin C, we love being able to stuff ourselves full of citrus. But there are so many different kinds! 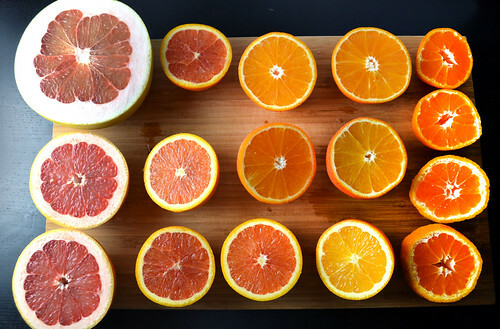 Grapefruits, mandarins, minneolas, oranges, how are we to know which one we want to peel and eat? Here's a helpful guide with some of the citrus you might receive in your box or available for customs. 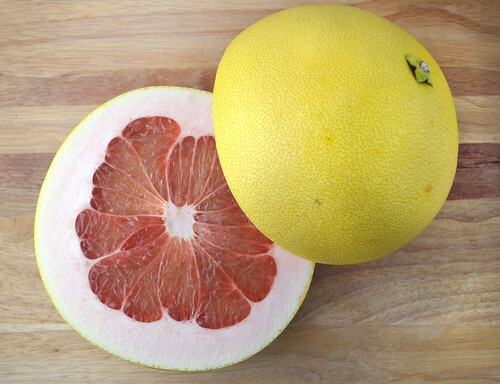 The pomelo is one of our favorite choices when craving that grapefruit flavor because it's mostly sweet, with a slightly tart grapefruit-like flavor. For those of you who aren't grapefruit fans or dislike the tartness of most grapefruits, we recommend trying a pomelo. Typically, the flesh of the pomelo is white, but they can range from pink to red, too, depending on the variety. The Chandler is the red variety and the Tahitian is the pale. PS: The reason we call it a "Pomelo Grapefruit" is so people know that a pomelo tastes similar (though sweeter!) to a grapefruit. 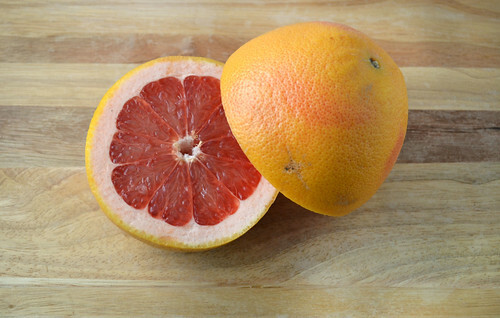 A cross between a sweet orange and a pomelo, a Ruby grapefruit is another good choice for eating or juicing, though they are more tart than pomelos. They're especially delicious sprinkled with some sugar and broiled. Try our Broiled Grapefruit recipe here. We also like putting grapefruit slices in salads or juicing them -- especially mixed in with some other citrus when we want a sweeter orange flavor with a little kick. 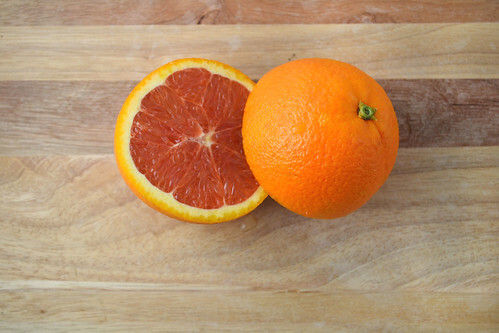 Also known as a pink navel, a Cara cara orange tastes like a sweet, juicy navel orange (which makes sense because they're a cross between different navel orange varieties). We love these for eating as a simple snack, but they're so pretty we also like to put them in salads, water pitchers or fruit salads where they can really stand out. Also known as tangelos, these tangerine/grapefruit crosses taste like a mild, slightly sweeter orange. They're most recognizable by the little ball shape at the stem and have a looser flesh, which makes them easier to peel than most oranges. They can be substituted for oranges in most recipes and are also a great snack. 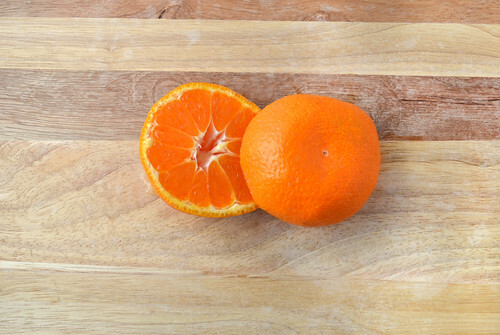 Did you know oranges are a cross between a pomelo and a mandarin? 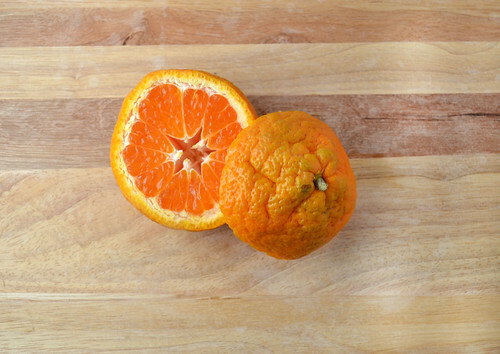 The classic orange best for eating (they're less juicy than Valencia oranges), the navel is easier to peel than most oranges and has that typical orange flavor we're looking for. An important thing to remember with oranges (and all citrus, but primarily oranges) is that toward the end of the summer, citrus will re-green because the trees push chlorophyll back out to them. So even though they're green, they're actually ripe and good to eat. Don't judge this wrinkly clementine by its cover until you've tasted it! Like a sweet, super-flavorful orange, we love snacking on these little gems because certain varieties are seedless and all are a dream to peel. 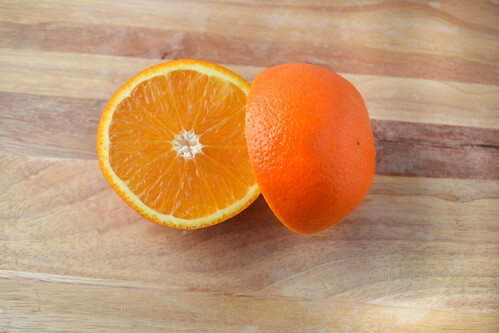 Technically, a clementine is a variety of mandarin. 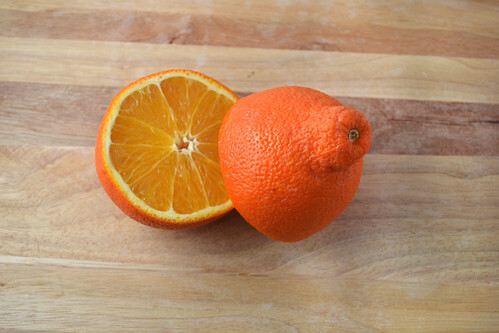 And just to make things more confusing, mandarins are also sometimes called tangerines. Most of the mandarins we grow on the farm are Satsuma mandarins. Similar to a clementine, they taste like a slightly sweet, slightly tart orange. They're seedless and easy to peel, making them ideal for snacking and juicing. Do you have any citrus questions? Let us know in the comments below! 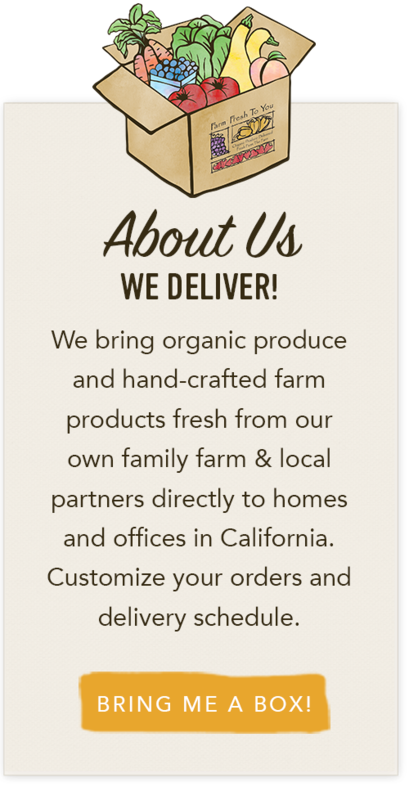 How To Add Citrus To Your Delivery: CSA members - head on over to our online Farm Stand Market to customize your upcoming delivery. On the second page of customizations, you’ll find “Produce by the Case” and can stock up if you want a larger batch of citrus for juices. The Market is open from noon on Thursday until 10 am, 2 days before your scheduled delivery day. After you confirm your produce items, click the orange button "Confirm and Continue To Other Farm Products" to add the products to your delivery. Winter has arrived to Capay. The evidence is the new green grass on the hills growing up that will soon overtake the last year’s dry grass, leaving the hills entirely green. Rain showers have started to show up on a routine basis, sometimes pounding and sometimes sprinkling the farm with water. Once that rain hits the ground, it always does the same thing – makes mud. Mud is such a game changer on the farm. The edges of fields when they are dry make dirt roads that can be driven on and for so much of the year, they are so reliably roads that it confuses me to not be able to drive on them after the rain. Now, they are not roads. Their lows spots make small ponds and their openness is a tempting trap that I always fall into. It never takes long to realize that I should not have tried. Had I been in my wife’s car, I would have stopped and backed up to the gravel drive. But in my truck, I keep going. Using the four-wheel drive, I slip and slide, leaving large ruts wondering if I am going to get stuck – it wouldn’t be the first time. When done, I look back at the ruts and wish I had backed up. The winter moisture always brings a different and beautiful season to the farm. The best days start as fog – fog so thick it is hard to see more than a 100 feet in front of you. The sun slowly burns the fog away from the top until it is gone, revealing the sky that is covered in a mosaic of clouds and blue sky. As the sun warms up, the soil that is saturated with moisture layer about eight feet deep and by mid-day, this too is burned off. By early afternoon, the clouds that have been hanging around, but not completely blocking the sky, start to sprinkle rain drops. The rain comes in spurts, and it is only raining on the farm. Beyond the farm, blue skies and beautiful clouds share the atmosphere. With the sun to my back and rain over my head, I look forward and that is where the rainbow is seen. This week, there was an amazing rainbow spanning the entire farm. The arc spanned from horizon-to-horizon and centered under the rainbow was our field of kales. Check the photo out on my Instagram @farmerthaddeus. Enjoy your boxes this week and if you are missing the farm, go find a big patch of mud to get stuck to the bottom of your shoes and when you go home, do your best to scrape off the mud from your shoes, but don’t take your shoes off – this will give you a good idea of what the floor of our farm office looks like right now! Super Foods Every Day - Cookbook Giveaway & Recipes! We are a few weeks into 2016 and I know that many of you are still clinging tight to healthy New Year’s resolutions – even if the thought of eating one more salad is making you want to run for the hills. But no worries, the simple secret is that delicious and nutritious variety will help jump start your meal planning game and keep you inspired for months to come. 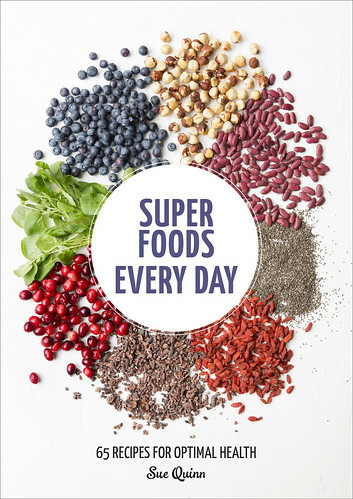 We recently discovered the newly released book by Sue Quinn “Super Foods Every Day” and are really impressed with her easy-to-follow recipes. She showcases super foods–ingredients from kale and seaweed to chia seeds and avocado that are packed with vitamins, minerals, and disease-fighting nutrients. In addition, look for her helpful super foods 101 infographic and illustrated glossary pictorial of each food’s key nutrients and potential health benefits. If you like experimenting with new super foods and are looking for inspiration to keep your New Year's health-kick rolling full speed ahead, this book is for you. Fresh fruits and vegetables are paired with things like tofu, tahini, chia seeds, quinoa and all sorts of unique ingredients. It’s a great way to try new foods and dishes. To win a copy of Super Foods Every Day, simply leave a comment below answering this question by Wednesday, January 27, 2016 (one entry per person please). What is your favorite super food? Why? No purchase required. Limit one entry per person, please. Entries will close on Wednesday, January 27, 2016 at 1:00 pm. Winner is chosen by Random Number Generator and announced on our blog on Wednesday, January 27, 2016. Tami: The versatile avocado! For so long it got a bad rap of being high in fat, but who knew, it turns out to be good fat! From the obvious guacamole, adding to a BLT, to now using it in baking as a replacement for other bad fats, it's an all around go to superfood! For the dressing, place the yogurt, tahini, lemon juice, and garlic in a screw-top jar. Season with salt and pepper, add 2 tablespoons of water, and shake vigorously to combine. Set aside. 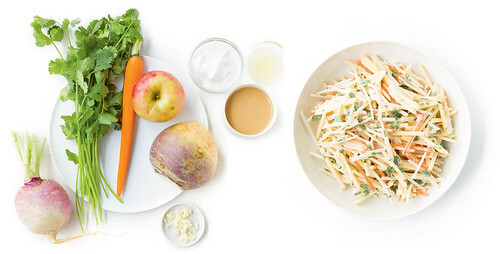 For the salad, place the vegetables and apple in a salad bowl and add the cilantro. Pour over the dressing and toss to coat. Add more lemon juice, salt, and pepper to taste. Set aside for up to 20 minutes before serving to let the flavors infuse. Cook the pasta according to the package instructions. Drain and toss with a little olive oil. Meanwhile, scrunch the kale with your hands to soften it, place in a food processor and pulse to a coarse paste. Add the garlic, the 2 tablespoons of olive oil, the basil, peanuts, and Parmesan. Process to the desired consistency, adding more oil if necessary. Add lemon juice, salt, and pepper to taste, then toss with the hot pasta. Serve sprinkled with Parmesan and chopped peanuts. 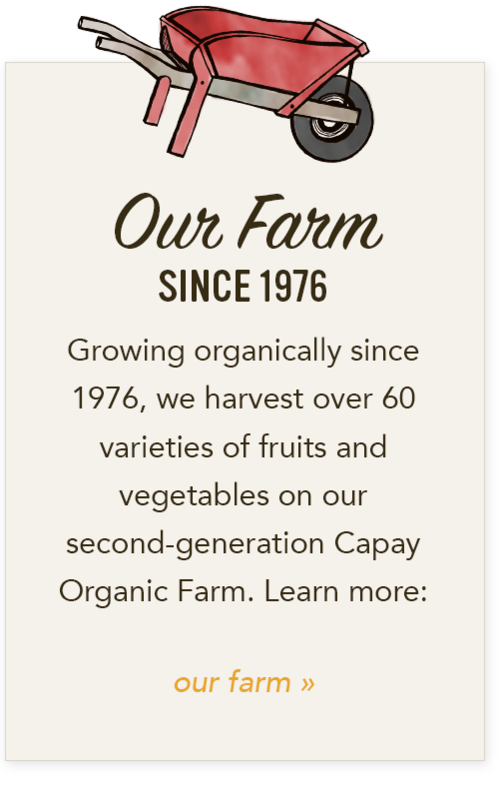 How To Add Super Foods, Pasta & More To Your Delivery: CSA members - head on over to our online Farm Stand Market to customize your upcoming delivery. The Market is open from noon on Thursday until 10 am, 2 days before your scheduled delivery day. After you confirm your produce items, click the orange button "Confirm and Continue To Other Farm Products" to add the products to your delivery. The soil on the farm is completely saturated with water from the rain – the entire week was overcast with showers off and on. On the first day of sun following the rain, field after field had steam rising from them. The sunshine made quick work of evaporating all of the free moisture in or on the soil. It looked really cool - the water vapors simmering from the earth back into the atmosphere. The clear blue sky was the backdrop of the performance. Soups are so comforting, especially in the winter. Sitting down to a big bowl of soup with nourishing, healthy ingredients feels like such a relief after holiday cookies and pies. Bring on the soup! This chili is loaded with beans and vegetables (though really it's all about the toppings when it comes to chili, isn't it?). Get the recipe for our Crockpot Chili here. Just looking at that soup makes us feel like we're getting over a cold. 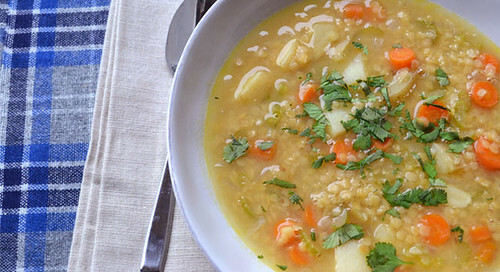 This soup has red lentils and potatoes and is really filling and satisfying. Try our Red Lentil Soup with Potatoes recipe here. 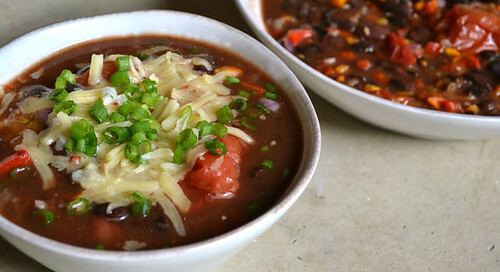 Plain and simple with amazing flavor, this is one of our new go-to soups when we have a cold. The eggs provide a ton of protein and the brown rice is a healthy grain. We love the fresh lemon flavor! 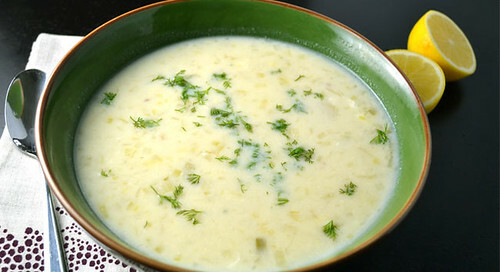 Get the recipe for our Greek Lemon Soup here. Not only is this soup delicious, but because it gets pureed, it's easy to sneak in veggies (if you're into that kind of thing). Though there is some milk and cream in this soup, the creaminess mostly comes from the pureed potatoes. 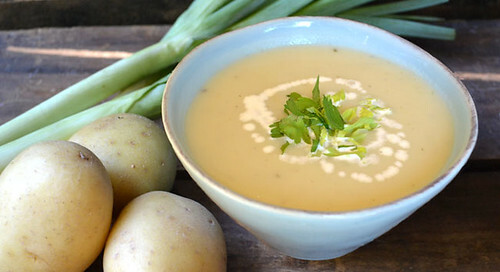 Try our Potato Leek Soup recipe here. 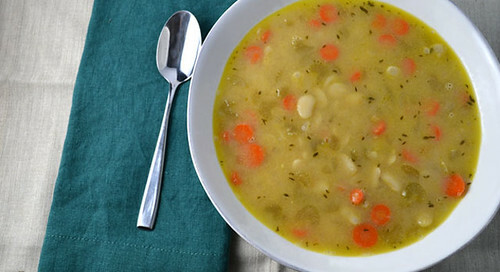 We promise this soup is worth making even though it has lima beans in the title. We used our Llano Seco beans in this recipe and they were SO good. Creamy and delicious, we bet you wouldn't even know they were lima beans! Get our Love Me Lima Bean Soup recipe here. How To Add Soup Ingredients To Your Delivery: CSA members - head on over to our online Farm Stand Market to customize your upcoming delivery. On the second page of customizations, you’ll find beans and lentils for the soup if desired. The Market is open from noon on Thursday until 10 am, 2 days before your scheduled delivery day. After you confirm your produce items, click the orange button "Confirm and Continue To Other Farm Products" to add the products to your delivery. In the last week, the fog has been paying many visits to the farm. The ability to see is based on the assumption that the physics of our environment allows our sense of sight to function. Fog changes our environment drastically enough to also change the fundamental sense of sight. Early in the morning, I walk along the roads of the farm knowing where I am going not because I can see, but because I know where the roads take me. In the distance, there is nothing but the cloud I am walking through. Near me is the road, some dirt and a gray area of things that are not yet identifiable, but are certainly there. Out of the mist, a fig tree materializes - not out of thin air, but thick air. It is kind of eerie, and my imagination creates the image of a horsemen materializing out of the fog. For a moment, it seems that anything can be just out of sight. The fig trees look very impressive in this context. Their leaves have been lost long ago and now their bare branches stand alone. The individual branches coming out of the base. Junctures of limbs add up to the mass of a huge tree that stands resolutely in the fog. The gray fig trees have a purple tint to them behind the white fog. The tips of the branches are dark. I take a moment to realize that on a clear day, the fig trees don’t look this way at all. My mind reminds me that the trees are exactly the same in the fog as they are in the sunshine. A hawk emerges and settles on a branch of a fig trees. The branch the hawk has settled on shakes slightly, acknowledging the hawk’s presence. I cannot see the details of the hawk, although the hawk is close enough to me that I realize it is not my eyesight that prohibits me from seeing the details of the bird, but it’s the murky air. This is one of the few moments that I can say my vision is as good as the hawk’s vision. The hawk has seen nothing worth eating in this tiny section of the world. On clear days, the hawk can rely on its superior eyesight to spot food while hovering in the air above or perching itself at the top of a tall tree. Today, the hawk must hustle for its lunch, visiting smaller pieces of the world. As quickly as it materialized onto the fig tree, the bird dives off the tree, flaps it wings a few times before disappearing into the foggy morning. The farm is different with the fog. I enjoy the change and breathe deeply. This is the winter season of the farm. Remember to follow us on Instagram (farmfreshtoyou) and (farmerthaddeus).